PULLMAN – Martin Stadium has changed a lot since Jerome Harrison raced up and down its sidelines on the way to the 2005 college football rushing title. Harrison and the rest of the 25 inductees into the WSU Athletic Hall of Fame sat at midfield on Saturday and marveled at the changes to WSU’s stadium since the days when some of them made it shake under the crowd’s roar. 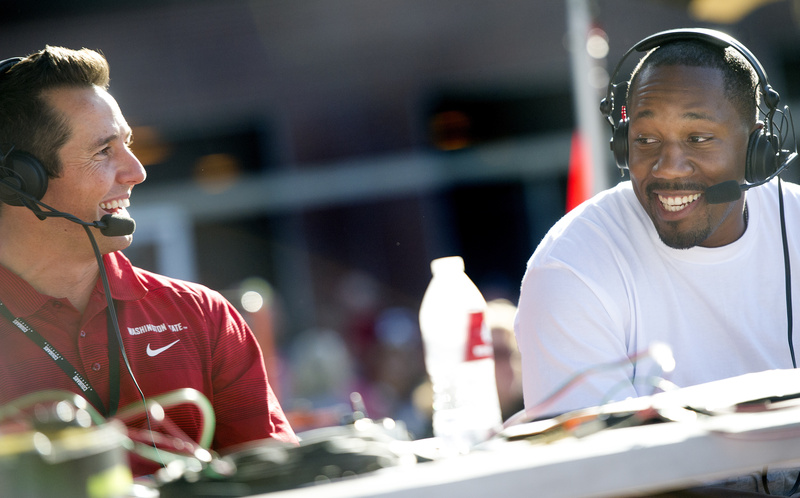 Among the honorees were Lamont Thompson and Marcus Trufant, the first two members of WSU’s 2002 Rose Bowl team to be inducted into the now 202-member hall of fame. Another honoree was baseball player Scott Hatteberg, who raised the WSU flag before the game. The other football players who are members of the 2015 class include Pat Beach, Steve Broussard, Wayne Foster, Alan Kennedy, Keith Millard and Geoff Reece. When Harrison ran for 1,900 yards his senior year, he did so on 303 carries, more than twice as many as the WSU running backs totaled last season in the pass-heavy Air Raid offense. But the WSU single-season rushing leader said he’d still be an effective player for the 2015 Cougars. Running back Keith Harrington was unable to make use of his prodigious speed while he stood on the sideline during his redshirt year. Now that he’s seeing the field, the freshman Floridian is quickly becoming one of WSU’s more dynamic playmakers. His 36-yard touchdown run in the second quarter proved to be the winner, giving the Cougars a 21-14 lead. It was the longest touchdown run by a WSU player since Rickey Galvin’s 48-yarder against UNLV in 2011. Harrington scored in the first game of his career, taking a screen pass 24 yards against Portland State. He had a second touchdown last weekend against Rutgers, and appeared to have a third, the winner, but officials ruled he stepped out of bounds. On Saturday, he led the Cougars in rushing with 68 yards on six carries and added 22 yards in the passing game. He shook off a tackler on his 36-yard scamper and raced to the left sideline, where he was uncatchable as he darted past the pylon. Afterward, he wasn’t entirely sure how it happened. “We’ve got assignments where we run, but after that I just black out and whatever happens, happens,” Harrington said.